Recovery: No pain and minimal Downtime. If you’re wondering how you can refresh your appearance without surgery, the Pellevé Wrinkle Reduction System may be right for you. The Pellevé System treats facial wrinkles with virtually no pain and minimal downtime. In fact, patients who have had a Pellevé treatment say it feels like a warm facial massage. Pellevé precisely delivers energy to the dermal tissue using advanced radiofrequency technology to induce collagen contraction without damaging the epidermis. The result is skin tightening and contouring with a noticeable improvement in skin quality and texture. Pellevé's unique radiofrequency technology emits energy in the form of electromagnetic waves, which create a heated treatment zone. 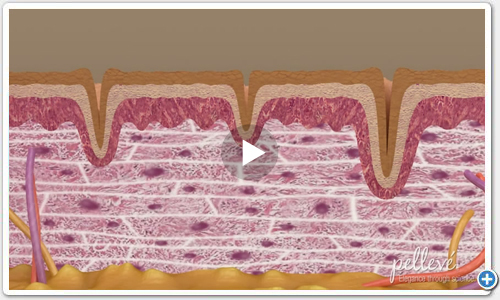 Increased resistance causes heat buildup at the subdermal junction. Heat induces collagen denaturation and collagen contraction. Protein stimulation causes new collagen formation and production in the dermis which also results in epidermal tightening. Existing bands of collagen tighten in subcutaneous fat, creating a superficial tightening of the epidermis. Individual results may vary, consult your doctor to make sure you are a good candidate for this treatment.